It doesn’t take much to realize when a vine is old. They resemble large bonsai trees with their gnarled, thick, twisting masses and often quitely plot out small patches of land in remote areas of wine country. Marketing strategies correctly lead consumers to believe that a certain precious quality exists within a bottle that displays the words old vines, vieilles vignes, alte reben or viñas viejas. Ironically, most countries lack a legal definition for what differentiates an old vine from a young one. It’s generally accepted that around age twenty-five a vine’s productivity starts to wane and therefore around it’s third decade it could be, in theory, considered old but we’re not talking about youngsters here, we’re concerned with the centanerians. As the productivity of an older vine ebbs, the fruit flavors become more concentrated and focused. Retaining a portion of older vines in a vineyard adds complexity to a cuvee, an added dimension for which consumers are typically willing to pay a premium but considering that wine is a massive industry, business decisions don’t always happen in a vineyard or winery. It’s easy to imagine spread sheets and other data being emailed back-and-forth between investors, informing their capital decisions on when to rip out vines and replant to ensure the best possible ROI for a particular parcel of land. With pressure like this, among a myriad of other factors that we’ll discuss in a bit, it truly makes the existence of old vines an anomoly. Consider for a moment that beyond providing additional flavor to a wine, old vines also contribute something to the lore and romance which surround wine. They express a sort of cultural heritage as they withstand obstacles from disease pressure to politics. Unfortunately this post will be too short to go into detail about the trials and tribulations of each and every one of the world’s wine producing regions synonymous with old vines so we’ll just take a moment to contemplate what a 120 year old vineyard in California adds to this discussion. Their legacy emerges from the simple act of surviving. They withstood over a decade of Prohibition. They were spared from the uprooting forces of development and urbanization. They were planted on sandy enough soils to avoid phylloxera outbreak in California during the 1980’s. They avoided consequences of general carelessness. They skirted demise via land owners replanting with different more profitable grapes like cabernet. 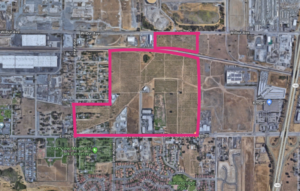 This endurance is exemplified by the Evangehlo vineyard in the city of Antioch, California (pictured above thanks to google maps.) This plot is surrounded by motels, powerlines, a railroad, and residential housing, hardly a location where one would expect to find the origin of highly celebrated fruit but pondering the site even more yeilds still more interesting thoughts. The sites of these old vineyards were planted before irrigation, modern pesticides and fertilizers. It’s fair to assume most old vine vineyards were multiple times larger at their outset. Whether it truly is the case or not, I like to believe that the location of the current vineyards to be the smaller, goldilock’s zone of the original site. The spot where generations of sentimental farmers just couldn’t give up the vines because the site produced such great fruit. Domaine Lafage Centenaire Cotes Du Roussillon Blanc, 2015, $15.99 – The average age of the Grenache Gris and Roussanne vines farmed for this wine is 90 years old. Darrin turned me on to this and honestly, I didn’t get it at first but out of faith I picked up another bottle and gave it another go. Amazing. I agree with him that this is a fantastic pick for a everyday table white. Floral with pomme and stone fruit aromas and nice palate density. This wine delivers incredible value. Bedrock Heritage Evangelho Vineyard Red Blend, 2013 $46.99 – Morgan Twain Peterson, the son of Joel Peterson, the mastermind behind the original Ravenswood Zinfandel, is sourcing grapes for his label Bedrock from some of the most celebrated old vine vineyards on the left coast. The Evangelho vineyard was planted with Carignane, Zinfandel, Mourvede and others. This wine is fresh with lifting acidity and bright, vibrant flavors. Check out the Bedrock website for a cool video of Morgan and his partner Chris, the two guys behind the label, discussing the history of this fabled vineyard. Birichino Cinsault Bechthold Vineyard 2016, $28.99 – Lodi’s Bechthold Vineyard homes some of the oldest cinsault vines in the world, with a whopping 132 years of age. Deep flavors of dark fruit, stone and earth permeate the wine with high notes of flowers and hibiscus. Bottled heritage. Cims de Porrera Classic Priorat 2004, $85.99 – Made from very old vines ranging from 50 to 100 years old. This is a truly incredible wine from the standout vintage of 2004. This has all the traits of a worldclass Priorat, insense, ripe black fruit, minerlity, violets. This bottle is peaking at the moment. Thank you for reading and we hope to see you around the shop soon!